21 Duel Blackjack is played with 6 decks. 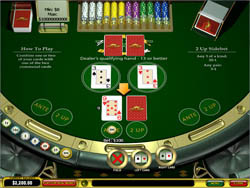 Cards are dealt as follows: player gets dealt 1 up and 2 down, dealer gets 2 down, and 2 up are dealt in the middle of the table – these are the communal cards. You then either fold and lose your bet, or you use your up card, along with one of the two communal cards, to start your hand. If you choose a communal card and keep playing, your bet is doubled. If you are now happy with it, you stand. Otherwise you can choose to hit, and your down card is turned over, becoming part of your hand, then you stand. The dealer then turns one of his card over, and chooses a communal card to start his hand. If it is 17 or more, dealer stands, otherwise he hits and takes his other down card. If the dealer’s hand is less than 13 he does not qualify. You win 1:1 on your initial bet and push on your second bet. If the dealer’s hand is higher than 12 and higher than yours, you lose on both bets. If your hand is higher than the dealer’s, you win 1:1 on both bets. Finally, if both hands are equal, both bets push. Remember, all hands totaling 21 are equal, so there is no blackjack in 21 Duel Blackjack! Minimum bet in 21 Duel Blackjack is 1, and maximum bet is 300. Because there is no blackjack hand, all wins pay 1:1 on both bets, unless your win comes because the dealer did not qualify, in which case you just win 1:1 on your initial bet, and your second bet pushes. An optional side bet of up to 60 enables bonus payouts. These pay if the three up cards on the table after the deal show matches. If there is a pair among them, you are paid 3:1 on your side bet, and if all three match, you are paid 20:1 on your side bet! Once you get used to the funky rules, 21 Duel Blackjack looks and plays treat. The graphics are photo realistic, from the soft, velvet stools, to the polished brass chip tray and the card shoes. The cards and chips are all nicely animated, and the whole game moves quickly and smoothly, so these flourishes add to the look of the game, but never get in the way of playing the game. As for gameplay, everything works great. The buttons come and go on the bottom of the screen, only appearing when they are needed. Again, once you get past the unique rules and figure out how the game works, it all plays very well. It’s not always the best strategy to pick the communal card with the highest value. If your up card plus a communal card totals around 11, stick with that card, even if the other gets you 17 or 18, because your down card might bring you closer to 21. 21 Duel Blackjack has some unique strategies involved, so play for free an hour or so to learn your way around. 21 Duel Blackjack is admittedly a tough one to learn, but in the end, it is absolutely, without any doubt worth while! The learning curve is about an hour, but you can use up Free Play time for that, so it’s no big deal. Learn the game, and you will be playing it more often the classic Blackjack! Try it today!